I’ve snapped a few photos and present them here, along with a few comments and personal opinions – all non-instructional in nature, starting with the front cockpit. If and when I take a few better photos, I’ll update this page – hopefully. 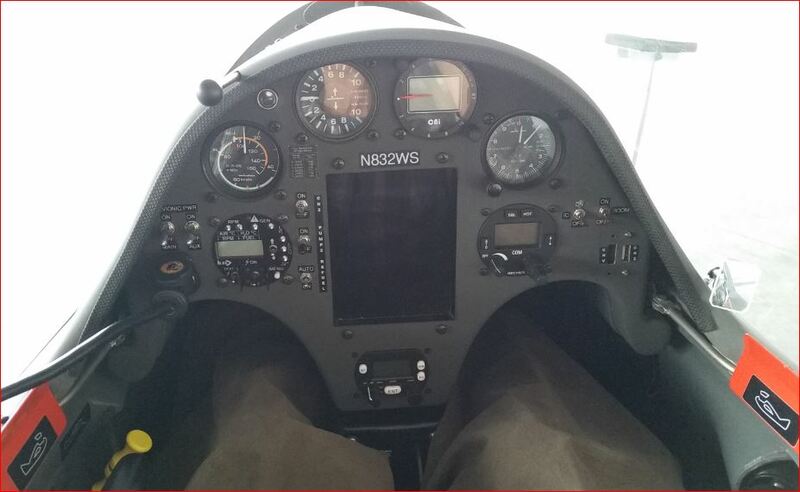 When I decide to fly a new aircraft, I find it necessary to spend time just sitting in the cockpit and looking around. Sitting in there for the first time, ten minutes before the rope is hooked up is just not adequate time for me to feel comfortable. You can use your personal pre-launch checklist that you always use. This is just another glider. 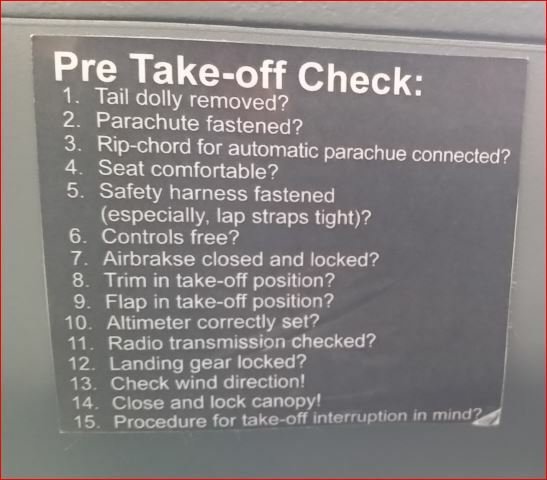 Send me your pre-takeoff mnemonic if you want to share it with others. As for me, I always use CBSIFTCB…. 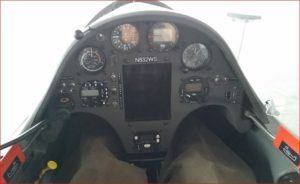 C = Controls, B = Ballast, S = Straps, I = Instruments, F = Flaps, T = Trim, C = Canopy, and B = Brakes. Each pilot has their version, but i suspect whatever you are comfortable using will probably work in this model. Lets look at the underside of this panel before we review the instruments. Here is a photo of that placard. 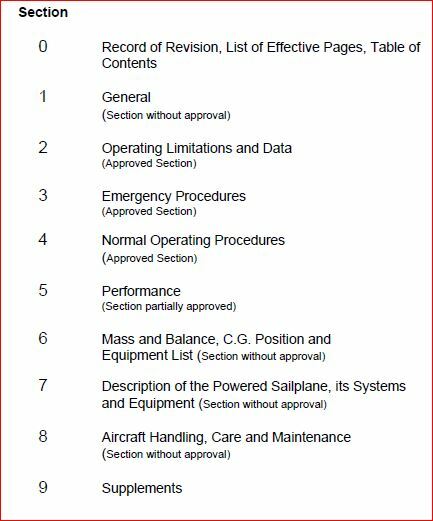 It appears on page 4.9 of the flight manual as well. 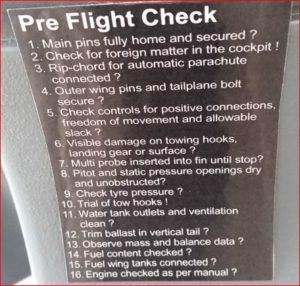 Obviously this Pre Flight Check is accomplished, before you entered the cockpit. This would be a good time to set up references to the flight manual. Note section 0 paragraph 0.3 is a table of contents. Let’s look around the cockpit, a section at a time. Here is the lower left part of the front panel. The battery charging cord is plugged in. When it is removed, the hole is covered. Above the charger socket are two switches labeled “AVIONIC PWR”. Left one is MAIN and the right switch is AUX. 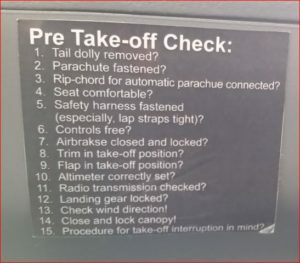 Before takeoff place the …..??Switch.. ….? 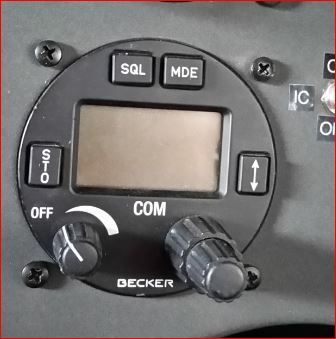 To the right of the battery switches is the “ILEC Engine Control Unit and Tank selector switch”. It is often referred to by the brand name of “ILEC” or alternatively, but not commonly, it is also referred to as the “ECU”, which, as you can see, is the label on the right side of the face. 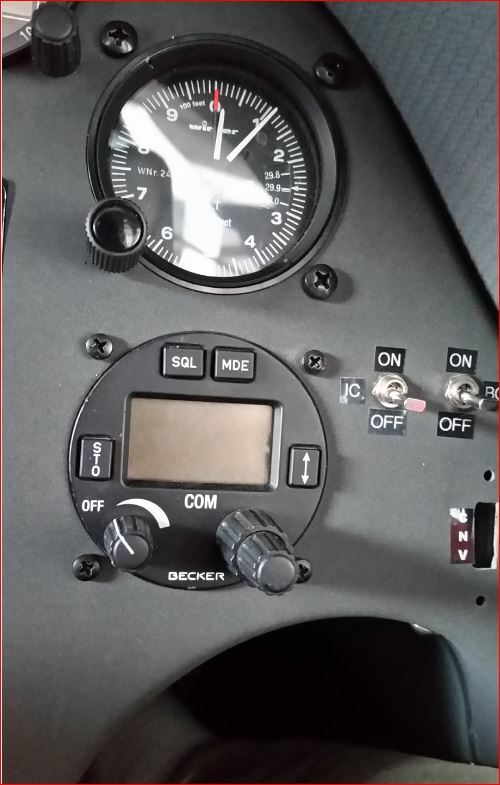 From part of page 7.22 of the flight manual, here is some description: The odd thing you may note is that it may be difficult to recognize the various switches and lights on the control unit while you are flying. 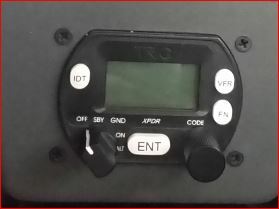 The ECU is not used frequently enough for you to know the switches by feel, and I can assure you they are tough to read. the ECU looks different – depending on how the light is striking the panel. 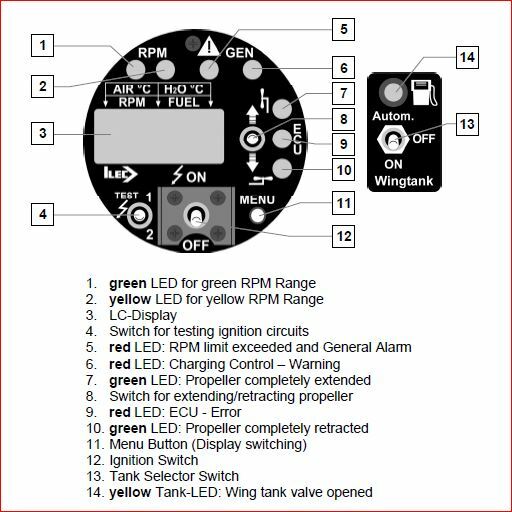 ….. You will need to spend some time studying this ECU panel, learn every light and switch, and know the engine operating procedures. 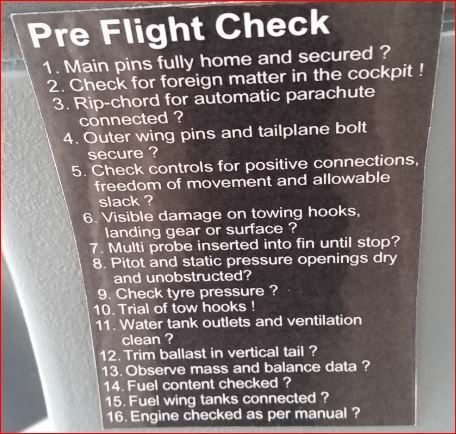 Or, alternatively, just fly with pilots who already know all of those things. Granted, you probably won’t be authorized to fly as PIC, but that is not a great loss, since this ship will probably always be flown by two pilots most of the time. 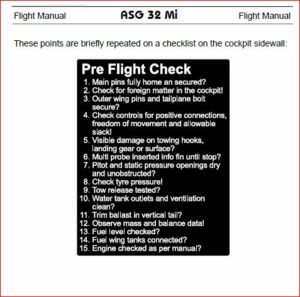 OK, enough stress and pressure about the engine, besides, I will create a new web page to provide sufficient detail and info which will enable you to feel more comfortable with engine operations. For now, let’s get back to getting comfortable in this “glider” cockpit! More about engine procedure and operation later. It’s a glider! … first and foremost. 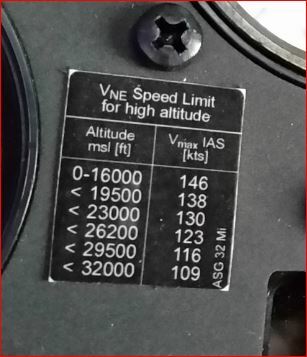 The only item discussed here is the airspeed indicator. A single needle now at zero knots. Read the outer ring and see the white arc beginning on the outer ring at 43 knots. when the forward tow release is used. setting 4. The trim should be set half-way nose-heavy. and see the remainder of the info in that paragraph. Read the Manual. 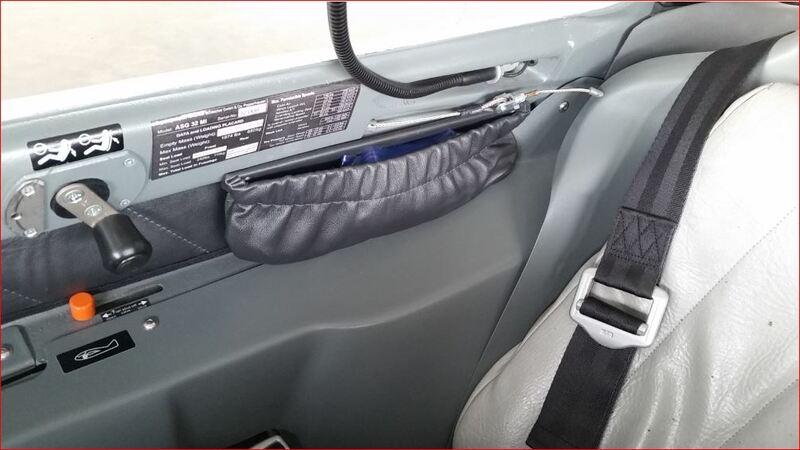 This might be a good time to show you the flap handle – located on the left side panel. It is aft of the Tow Release and above the trim position indicator and the Spoiler Handle. 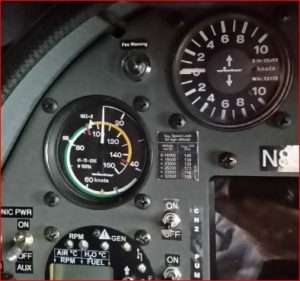 Reading from left to right – all the way aft is Landing, 6 and 5 are thermalling flap settings, 4 and 3 are neutral, with the shift from 4 to 3 occurring above approximately 80 kts (depending on weight). 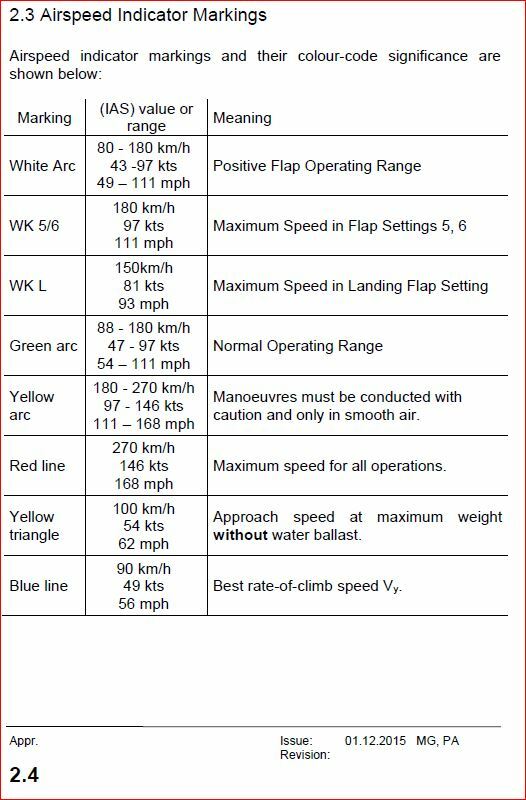 Setting 2 and 1 are for flying fast (SCHNELLFLUG), but study your polar curve to see the altitude price you pay for speeds above 90 kts. Back to the front panel – I won’t comment on the Fire warning light, VVI. The Vne Speed Limit placard is rather fine print for those with weak eyes. 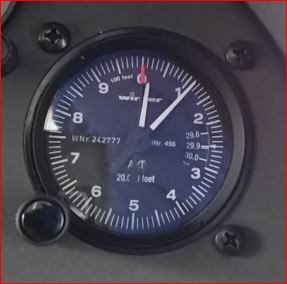 Altimeter may not be what you are used to seeing – it is a small one. And, not part of the front panel, but immediately below it is the throttle quadrant. 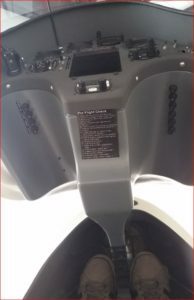 Throttle on the left and prop brake on the right. The Red Starter button is below the prop brake. 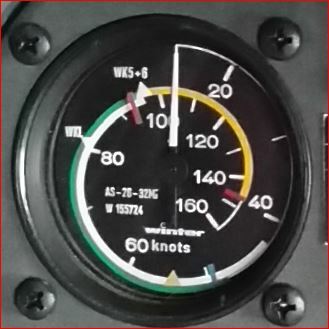 On the lower right of the quadrant is the rudder pedal adjustment release. Another view…. See the pocket adjacent to your left shoulder. Forward of that is the Pre Take-off Check. Then the flap handle and then the tow release. The Spoiler handle also serves as the brake handle. note the placards showing a skidding tire on the left and a turbulent spoiler on the right placard. The Elevator trim is very effective and easy to use. Pull the green trigger to release the trim. Full aft and full forward move the neutral position of the stick about six inches. 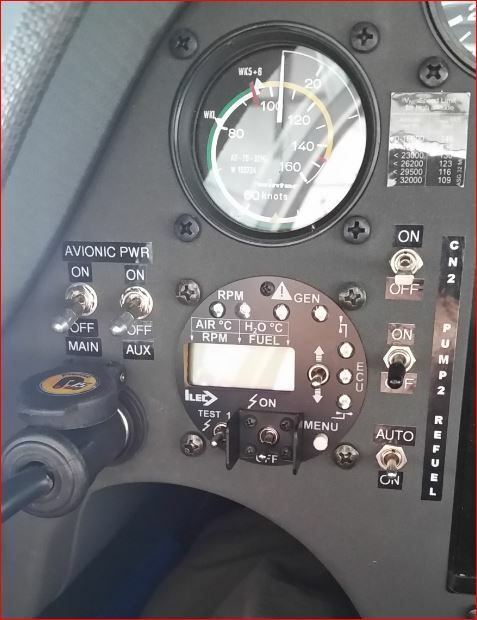 This is full aft – see the green indicator button on the aft stop. Front set, right panel also has a pocket near your shoulder. Forward of that placard is the crank for adjusting your seat back and forward of that is the air vent. 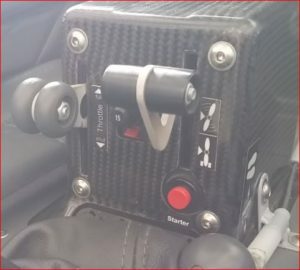 Along the lower part of that panel, front to back , you can see the gear handle, the water dump control handle, and the knob for the fuel shut off valve (below the crank handle for the back rest). 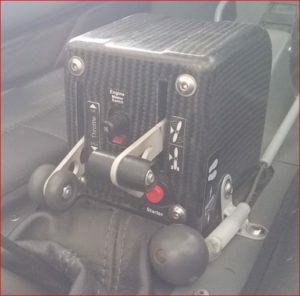 A very special note about that gear handle. There is no outboard detent in the extended (or retracted) position (like there is in the ASH26E and others). So a positive lock is not easy to observe after you PUSH THE GEAR DOWN. 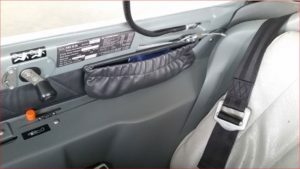 Further on this special note – if you push the gear down the handle will meet resistance just before it is fully down and locked (how bad is that! ), so LOOK at the handle after you give it an extra shove forward during gear extension. That’s it on the front seat. You’ve seen all of the panels and most of the placards.